It was mostly overcast throughout the day, but the sun started poking out in the late afternoon. Temperatures were in the 40s throughout the day, though it is now down to 38F according to the thermometer in our carport. I went for a walk this evening. There was nice light filtering through the broken overcast. The overcast skies still held over the mountains behind town, but the warm soft light was highlighting the snowy peaks of the Pyramids and Mt. Kincaid across Crescent Bay and Eastern Channel. I noticed a dipper singing. That is not so unusual, but the dipper seemed to be down at the hatchery. I guess the hatchery might not be a bad place for a dipper (as far as the dipper was concerned anyway, the hatchery manager might not be so fond of a dipper using the incubation rooms and circular ponds as all-you-can-eat buffets). I just do not recall having seen or heard one there before. However, now that I think about it, I do remember hearing a story about a dipper who walked/swam up the drain channels in the floor of one of the incubations rooms and then would get into the salmon fry being reared there. On my way back home I revisted a spot in the woods near our place where I had previously noticed a large quantity of bird droppings. It still puzzles me why the birds would have congregated there. The trees did not look like good roosting trees to me as they were tall with few branches. I did notice the droppings were more widespread than I had initially thought. The only other explanation I could think of was that quite a few birds had been hanging out in the woods during the cold snap. The larger than normal number of birds combined with below freezing temperatures allowed the droppings to build up more than usual before decomposing. I’m not convinced by this explanation, but it is the best I have. Also on my way home, I stopped by a tree to sit and watch for a little bit. 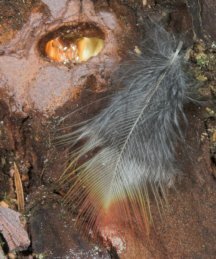 While I was sitting there, I happened to look down at the base of the tree and notice a small feather. Upon closer examination, I discovered it had a red tip with a little bit of yellow just below that. It was a feather from one of the many Red-breasted sapsuckers that had been in the area late last week. I placed it near one of the fresh holes and took a picture of the two together. This entry was posted in activities, birds, photo, tracks and sign, weather. Bookmark the permalink.